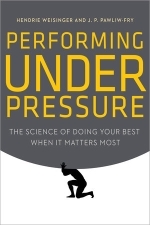 The subtitle of Performing Under Pressure by Hendrie Weisinger and J. P. Pawliw-Fry, The Science of Doing Your Best When It Matters Most covers the book’s content very well. Clearly distinguishing pressure and stress, both authors dive into pressure management. Nobody performs better under pressure. Decision-making skills suffer from pressure. Performance, judgement, and attention are influenced negatively in both professional and personal areas of life. The authors use many examples from athletes, businessmen, entrepreneurs, musicians, and presenters. Performance Under Pressure draws from a research among 12,000+ people and contains findings from other neuroscience, and psychology. Professor Daniel Kahneman‘s Thinking, Fast and Slow is consistent with these authors’ point of view. Counter-intuitive at times, precisely why you’re fooled by your own brains when performing under pressure. Besides lots of theory in the first part, the second part of the book offers 22 strategies to reduce pressure and perform better. The third part makes it even more practical by stressing the importance of confidence, optimism, tenacity, and enthusiasm. This completes the acronym COTE of armor to ride with the four horsemen and face life’s challenges when it matters most. Some of the personal tests can be done online at www.pressurebook.com. Hendrie Weisinger, PhD, is a world-renowned psychologist and pioneer in the field of pressure management, as well as the author of a number of bestselling books. He has consulted with and developed programs for dozens of Fortune 500 companies and government agencies, and has taught in Executive Education and Executive MBA programs at Wharton, UCLA, NYU, Cornell, Penn State, and MIT. J.P. Pawliw-Fry is an international performance coach and advisor to Olympic athletes and senior business executives. Among his clients are Marriott, Unilever, Allstate and the Orlando Magic. Formerly he taught executive education at the Kellogg Graduate School of Management. He is president of the Institute for Health and Human Potential (IHHP), a research firm that trains and coaches leaders and organizations to perform more effectively under pressure.